What’s the healthiest way to send your kids to school? With healthy snacks from Maisie Jane’s, of course! Our four delicious new snack pack choices will help your children keep their blood sugar and energy levels stable all day long. And they provide real nutrition —lots of protein, healthy fats, lots of vitamins and minerals —that will keep their bellies full while doing their minds and growing bodies a lot of good. 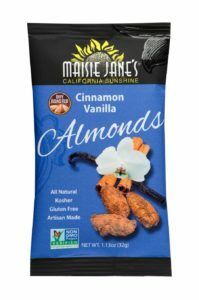 Each of our carefully sized snack packs holds just the right number of deliciously flavored almonds for optimum nutrition combined with a thought to calorie consciousness. So easy to throw in a backpack and easy to eat, too! Do your kids like things a little spicy but not TOO hot? 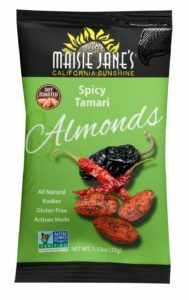 Our new Spicy Tamari Almonds have a wonderful smoky salty flavor with just the right touch of heat. 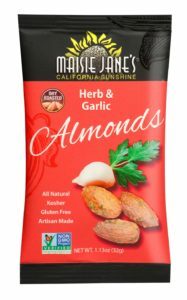 Not as spicy but truly delicious, our Herb & Garlic Almonds are a favorite for like a savory taste sensation. Use these not just for snacking but for dressing up a salad or for crumbling into a variety of delicious recipes. Do your kids prefer a mix salt with sweet? 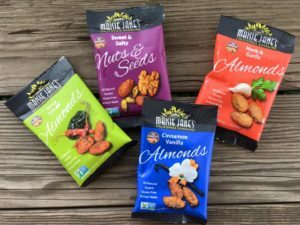 Our Sweet and Salty Nuts and Seeds packs are awesome! Only something sweet will do? Make their snack treat a healthier one! Our new Cinnamon Vanilla Almonds are lightly sweetened, dusted in cinnamon and drenched with pure vanilla. They’ll love them! 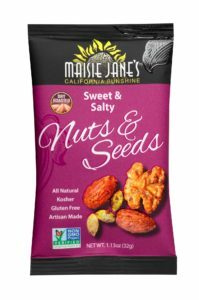 We’re proud to say that all Maisie Jane’s snack packs are all natural, artisan-made from dry roasted nuts, and all the ingredients are Kosher Certified, Gluten Free, and Non-GMO Project Verified. to get a taste of another new amazing snack pack flavor.